...was a 30 minute TV special broadcast by CBS on 8 March 1959. It was the last television appearance together of the three Marx Brothers. CBS explained: "If you watch the show you'll see a familiar face equipped with mustache and leer. Because of his contract terms, his name can't be mentioned". The working title of this TV special was The Best Laid Plans. In pantomime (with music on the soundtrack) Harpo as Nick and Chico as Harry break into shops stealing the equipment to disguise an automobile as a police car. Outside a jeweller's shop selected from a stolen telephone directory, Harpo dons a disguise which includes a Sherlock Holmes cap. With his back to camera he also put on a one-piece pair of glasses with attached eyebrows, a fake moustache and a cigar - and becomes Groucho! He paces up and down the pavement, exactly imitating Groucho's walk before going in to hold up the store. 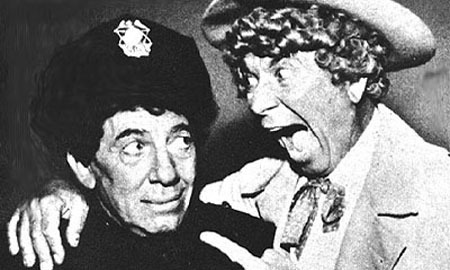 Chico comes along dressed as a policeman to "arrest" Harpo. They flee but have to pick up a woman outside a deaf and dumb home - preserving the ban on words - and deliver her to a maternity hospital. Eventually caught, they're put into a line-up at the police station. Chico is identified as the fake policeman but Harpo escapes through not being in disguise any longer. Suddenly - and for no reason - Groucho enters and lopes up and down the line, cigar in hand. He is picked out as the hold-up man. Then, as Harpo and Chico dashes to his side and Harpo hands over his leg, Groucho speaks the first and last line of the film: "We won't talk until we see our lawyer." Down comes the little wooden duck used on You Bet Your Life with a sign saying The End in its beak.